In this series I'll explain some of the philosophy of Chinese Five-Element theory. My intent is not to try to teach acupuncture, but to illustrate how Traditional Chinese Medicine (including acupuncture) can be useful for a whole host of conditions. Perhaps something will spark a thought about how acupuncture might help with something that your pet is having trouble with. Or perhaps it will help explain why I choose to treat along certain meridians. In Traditional Chinese Medicine, there are five elements governed by five main organ systems- Liver, Heart, Spleen, Lung, and Kidney. These five elements also correspond with five seasons or time of year- spring, summer, late summer/ early fall, late fall, and winter. These elements interact with one another in a myriad of ways to help heal and, when the interaction is disturbed, to exacerbate disease. These interactions comprise a fascinating but complex school of medicine. I’ll talk about some of the other elements at another time, but the one most applicable to early fall is Earth. Late summer into early fall is the harvest time; think fields of waving yellow wheat and stacks of orange squashes. The color associated with the Earth element is yellow. Earth personalities are nurturing and easy-going. Over the cycle of a lifetime, this is the time when young adults begin to settle down and raise a family. Earth types are also worriers, like the mother staying up late as her offspring carouse late into the night. The organs associated with Earth are the Stomach and Spleen. This last is probably the one most difficult to wrap your head around, because in the traditional medicine philosophy, Spleen doesn’t necessarily refer to the immune-regulating and blood-filtering organ, but to the gastrointestinal system (think pancreas, as if a bad translation of Chinese texts substituted the word “Spleen” for “Pancreas”). Thus, the function most associated with the Earth element is digestion. Digestive problems such as vomiting, inappetence, and other gastrointestinal upsets associate with Spleen and Stomach points. Other body parts of note that associate with this element are the mouth, lips, and muscles. Thus I look to the Spleen or Stomach channels as I treat animals with oral lesions or muscle injuries. Damp is a problem for Earth animals; Damp conditions can be tenuous and sticky, and may congeal. Thus warming and drying herbs or foods may be prescribed when a problem develops. If any of these are an issue for your pet, ask about acupuncture treatment to alleviate their symptoms and restore normal function! 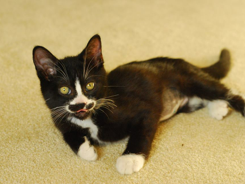 Are you curious about acupuncture in pets? Do you want to know what to expect during your pet’s acupuncture session? Watch as Dr. Glover demonstrates a typical acupuncture session with Signe the greyhound. Thanks to Greyhound Pets, Inc. for allowing us to film the session. There are five elements in many philosophical traditions throughout the world. The ancient Greeks had Air, Water, Fire, Earth, and Ether. The ancient Babylonians thought the five elements were Wind, Fire, Earth, Sea, and Sky. The Chinese also had five elements, which influenced the organization of their system of Traditional Chinese Veterinary Medicine (TCVM). These elements are Wood, Fire, Earth, Metal, and Water. In modern thought, these five elements are not taken in the literal sense, but they do stand for certain systems or groups of organs and certain characteristics. These groups interact in various ways to maintain health and when the interactions become imbalanced show up as symptoms of disease. The TCVM practitioner considers these interactions when making a treatment plan to put everything back into balance. Wood is associated with the Liver and Gall Bladder as well as with the eyes and vision, tendons, and ligaments. Animals with a Wood personality tend to be athletic and confident, even a bit competitive. Owners may say that their pet is bossy or possessive. These animals may also be irritable and become angry very easily. Fire is associated with the Heart and Small Intestine. It is also associated with the Pericardium (the membrane that surrounds the heart) and the Triple Heater, that is not really an organ but a means for nutrients and energy to be distributed throughout the body. Blood vessels are also associated with the Fire element. Animals with a Fire personality are friendly, very excitable, and can be quite noisy. These are the dogs that love to meet everyone on their walks and are hard to keep still when someone comes to visit! Earth is associated with the digestive system (termed the Spleen in TCVM) and Stomach, and with muscles and taste. The Earth personality is laid-back and nurturing; these are the animals that don’t mind playing “dress-up” with your toddlers! On the downside, these animals can also be worriers. Metal is associated with the Lungs and with the Large Intestine as well as with the skin and coat and with the sense of smell. These animals tend to be a bit aloof, quiet and confident, and disciplined. They follow commands quite well and seem to know what is expected of them. Water is associated with the Kidneys and Bladder and with bones, the ears, and hearing. The personality of Water is fearful and shy. The cat that hides under the bed at the slightest provocation or the dog that cowers behind its owner’s legs when another dog approaches- that’s Water! This is just a quick summary of the five elements. Your veterinary acupuncturist or other TCVM practitioner will have studied the characteristics and interactions of the five elements in much more detail and will understand how imbalance in one area may affect the expression of the elements in another area. S/he will then choose the best treatment plan to bring everything back into balance and help your pet to be healthy and happy! 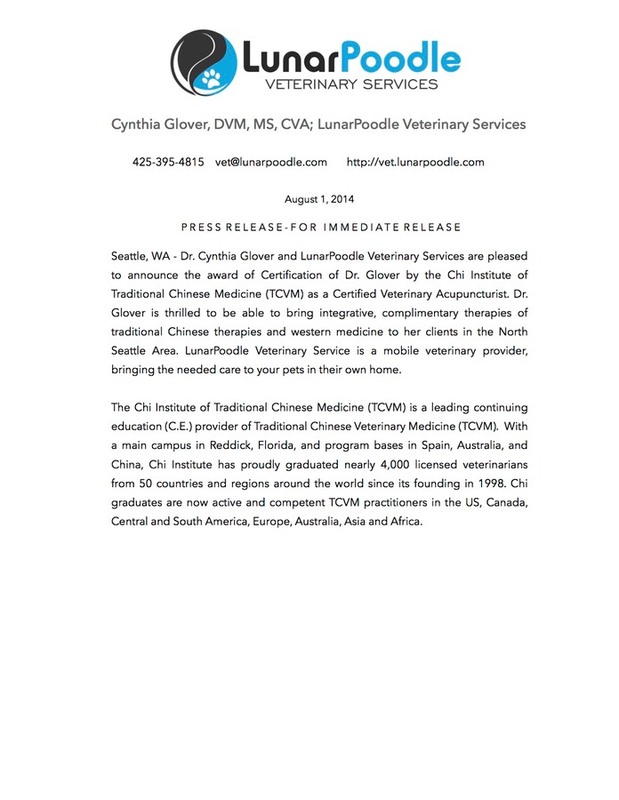 Dr. Cynthia Glover of LunarPoodle Veterinary Services practices TCVM in-home and in weekly clinics at SplashDog in Edmonds. Published in the November/December 2014 Pet Connection Magazine, North Sound edition. It began with a cat I couldn’t help. She clearly wasn’t doing well, but despite numerous tests, my colleagues and I couldn’t pinpoint the problem and could only get partial improvements in response to treatment. Even with all of modern veterinary medicine at my fingertips, there was only so much Western medicine could do. And so I, like many other veterinarians, began to explore more ancient wisdom for “something else.” And I, like so many others, found the answer in Traditional Chinese Veterinary Medicine (TCVM). The oldest stone acupuncture needles, found in Inner Mongolia, are about 8000 years old. The first evidence of veterinary acupuncture is about 3000 years old, beginning with the writings of Bo Le (Bo’-lo), an ancient Chinese equine specialist. But TCVM didn’t stop with the ancient philosophers. It continues to evolve, incorporating modern devices such as electrical stimulation (electroacupuncture) and many carefully controlled scientific studies. Many people are familiar with one aspect of TCVM − acupuncture. But did you know that acupuncture is only a fraction of the methods TCVM practitioners may use? There are actually four aspects of TCVM philosophy: acupuncture, Chinese herbs, tui-na (a type of Chinese massage therapy), and food therapy. Acupuncture involves the placement of very thin needles in precise locations on the body to help regulate the flow of Qi (chee), or energy, throughout the body. Some points have special properties that help with a particular condition. Acupuncture may also involve warming the points with burning herbs, called moxa, injection of a small amount of fluid under the skin at a particular point (aquapuncture), or electroacupuncture using a low level of electricity to stimulate the Qi flow between certain points. Prescribing Chinese herbs forms the biggest fraction of TCVM. Various herbs, mainly derived from the roots, stems, bark, leaves, flowers, or fruits of various plants, have specific properties that aid in healing and balancing the body systems. Herbal formulas are easy for owners to give at home. Many come in powders or tinctures that can be given with a meal; capsules, biscuits, or tiny round pills called teapills are also available for many formulas. Tui-na (twee-nah’) is the manual therapy aspect of TCVM. It includes pushing, pulling, and touching or massaging along the meridians or channels of the body or at specific points or areas. This can include “homework” that the TCVM veterinarian may give to owners so that they can continue the beneficial balancing at home. Much like herbs, foods have particular characteristics too. Some foods are warming, some cooling. For example, is there nothing more refreshing on a hot day than a juicy, cool slice of melon? The TCVM practitioner may advise certain foods or methods of preparation to help balance the body systems and help the animal heal and remain healthy. This is the basis of food therapy. Traditional Chinese Veterinary Medicine really is a complete system of medical treatment for animals. It can be used along with Western medicine and is a great choice for those hard-to-treat cases. Dr. Cynthia Glover, of LunarPoodle Veterinary Services, practices TCVM in-home and in weekly clinics at SplashDog in Edmonds. 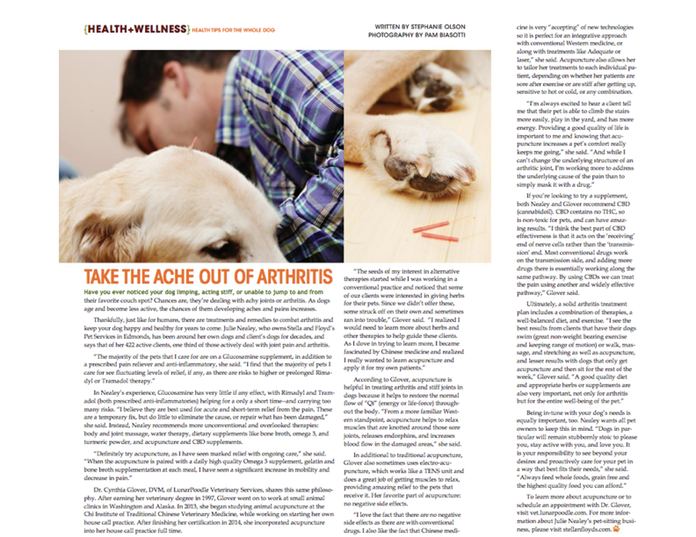 Published in the September/October 2014 Pet Connection Magazine, North Sound edition. You very likely have an emergency plan for your family: you know where to take an injured family member; you may have taken a first aid or CPR course so that you can provide aid in case of a crisis; you may even have supplies on hand in case of a storm or power outage. Your kids practice emergency procedures in school. But do you have a plan for your pets? If your dog or cat is wounded, do you know how to stop bleeding? What if he or she ingests some toxin? What if an emergency arises late at night, when your veterinarian is out of reach? It is helpful to have a first aid kit available for your pet. You may want to include items such as absorbent compresses to apply to stop bleeding, disposable gloves, a leash, and sterile water-soluble lubricant such as KY jelly, a digital thermometer. While you are stocking up on supplies for your family in case of a power outage or storm, be sure to include your pets, too! Food and water sufficient for about 3 days, extra bowls, and a manual can opener are good items to have on hand. Be sure to have the number of the nearest emergency clinic on hand! Also have available extra leashes and/or carriers so that you can easily transport your pet if the need arises. A mobile app, such as the Red Cross Pet First Aid app, is a great way to find more information about emergency procedures for dogs and cats, assembling an emergency kit for your pet, and organizing your pet’s medical records. You can find information at http://www.redcross.org/mobile-apps/pet-first-aid-app, or get the app in the iTunes or Google Play app stores. Ah, the holidays! Lots of good food, good company, and decorations throughout the home! In the midst of all of this excitement, let’s remember to keep our pets safe and snug so that they can enjoy this time with us! Food: It’s tempting to share our treats with our furry family members, but use caution! Chocolate contains theobromine that may cause a rapid or irregular heart rate, vomiting, diarrhea, or seizures. Baking chocolate contains higher levels of theobromine than does milk chocolate, but to be on the safe side keep all chocolate out of reach of your pet. Rich, tasty holiday treats often contain high amounts of fat, which can cause the pancreas to work overtime and result in pancreatitis. Avoid giving fatty skin, ham and bacon, or other rich foods to pets. Turkey bones may easily splinter and damage the esophagus, stomach, or intestine causing ulceration or perforation. Watch out when you discard the turkey bones- although you may not give your dog these bones, they smell delicious and a sneaky pup may find a way to snag a bone in secret! Make sure the carcass is safely discarded in a closed container away from temptation. Also carefully discard any strings or pop-up thermometers- soaked with the juices from your roast, these can be tempting but may result in emergency surgery to remove them! Decorations: Pretty and festive, but be sure to avoid accidents. Candles may smell enticing and are a source of curiosity, but they can easily be knocked over and burn your pet or cause a fire hazard. Don’t leave burning candles unattended, and keep them out of reach of curious noses. Some holiday plants can pose hazards to pets, so make sure they are out of reach. Poinsettias may cause gastrointestinal upset, mistletoe can cause heart and stomach problems and may be fatal to pets, and amaryllis may cause vomiting or diarrhea. Additives in water for Christmas trees, designed to keep the tree fresh, may be toxic to pets. And be sure any electrical cords are inaccessible for chewing and mouthing! Finally, with an influx of visitors, shy pets may become very stressed. Make sure they have a quiet area to retreat from the hustle and bustle. Also watch the door with the frequent comings and goings of visitors. Don’t let your beloved pets escape! Make sure they have current identification tags, and microchipping is a good idea. May your holidays be merry, happy, and safe! Make sure to chip your pets! LunarPoodle Vet will microchip your pet at home! Welcome to LunarPoodle Veterinary Services! As of September 1, 2013, LunarPoodle is “live” and accepting new clients! Please call me at (425) 395-4815 or email me at vet@lunarpoodle.com to schedule an appointment for veterinary care in the convenience of your pet’s home. In the coming months I will be adding content to the website. Meanwhile please explore freely, and contact me with any questions you may have about available services.